A new study has provided further evidence that the perception of minerality in wine is not linked to soil. The findings emerged from the second part of a two-year research project, titled ‘Minerality in Wines‘, conducted by Spanish wine analysis company Excell Ibérica and Outlook Wine. The results of the study indicate that the chemical composition of wines and their perception as ‘mineral’ are not directly linked to the minerals in a vineyard’s soil. Rather, a variety of volatile chemical compounds derived from the metabolism of the vine, the fermentation of yeast and bacteria, as well as from techniques applied in the winemaking and ageing processes, were found to be responsible for the perception of minerality. Identificatory cues also played a significant part in the identification of minerality. The first part of the study, ‘Chemical Bases of Mineral Character at Olfactory and Gustatory Level in White and Red Wines’, identified a number of chemical compounds in 17 wines which were considered to be representative of minerality. The second part of the study involved the consistent identification of these compounds in a series of synthetic wines in directed and non-directed blind tastings. The tastings were performed by two qualified tasting panels, one made up of winemakers and another by wine sector professionals. “Both in the olfactory phase of the research as in the gustatory phase, the selected tasters coincided in the identification of certain elements allowing [us] to define the term mineral in the samples, but not all of them from parameters linked to the soil,” the researchers explained. The study also concluded that the descriptor ‘minerality’ is not linked to the presence of one or two chemical compounds, as would be the case for soil minerals, but rather the result of a mixture of compounds, which sometimes provide a gustatory sense of minerailty, sometimes an olfactory one, and sometimes both together. The researchers also indicated that identificatory cues played a significant part in the identification of wines as ‘mineral’. 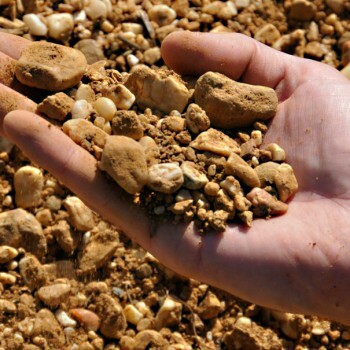 The study, which was carried out over a two-year period by Antonio Palacios of Excell-Ibérica in Logroño (La Rioja) and David Molina of Outlook Wine in Barcelona, adds to the growing body of evidence against the traditional belief in terroir-based minerality. A recent report in Nature provided new evidence for a microbial aspect to terroir. Writing for the drinks business, Sally Easton MW has previously revealed how minerality in wine is most likely to stem from volatile thiols or esters and not directly from nutrients in the soil. I have long been of the opinion that the elusive description of minerality is at best related to perception of acidity in wine. That it is no way directly related to the mineral content of the soil has been obvious by the lack of mechanism for the vine to absorb most minerals, and the general confusion of most people between rocks and minerals. The classic description of “it is like licking a rock” is problematic in that a clean rock is not particularly water soluble, and therefore has no actual taste. The general disagreement over which wines exhibit the characteristic has been enough for me to avoid the term outright. If there is now agreement on what the term represents, I can only hope it will be used as such. It would be interesting to see if these “minerality”compounds & esthers show up more often or more intensely in regions often described by the term minerality, such as Sancerre. Oh well. It was fun while it lasted. Can we call it something else? Texture? Savouriness? If you dismiss variations in the sensory components of wine due to “terroir”, you must also dismiss variations ascribed to “vintage”. Terroir is about much more than the “mineral” (really plant available nutrient) component of soil. Climate is the most important component of terroir and it varies with regard to both space (site), and time (vintage). Soil minerals (e.g. quartz, feldspar, calcite, clay) are not present AT ALL in wine. What’s present are nutritive elements (mostly cations) in the minute concentrations that are required by the plant to grow and produce various organic compounds – including those that, during fermentation lead to taste and aroma compounds. At present, our understanding of role of soil-derived nutritive elements in the synthesis of flavor and aroma compounds is almost non-existent. To say that “minerality is not related to minerals absorbed by grapevines” is stating the obvious and is something that was never even taken seriously by the scientific community. To say that “grapevines and the wines produced from them are unaffected by variations in the availability and concentrations of mineral-derived nutrients” is ridiculous – as ridiculous as saying that your health is unaffected by vitamins. I completely agree with Myron. Can we have an article to this cause please DB? Typically a new world article. You can not taste minerality, but it does have its influence on the taste. Australians prove the origin of wines by linking chromatographic results to ‘terroir’. Completely agree with Kevin Pogue. Simply looking at Mosel, Nahe, Pfalz and Alsace shows that soil and mineral content has distinctive influence on the wines. This is not because we don’t identifie a relation between minerality taste and soils, that there’s not relation.